The 13th Annual Stupka Symposium will be held on April 5, 2018 in the Molecular Biology Building. 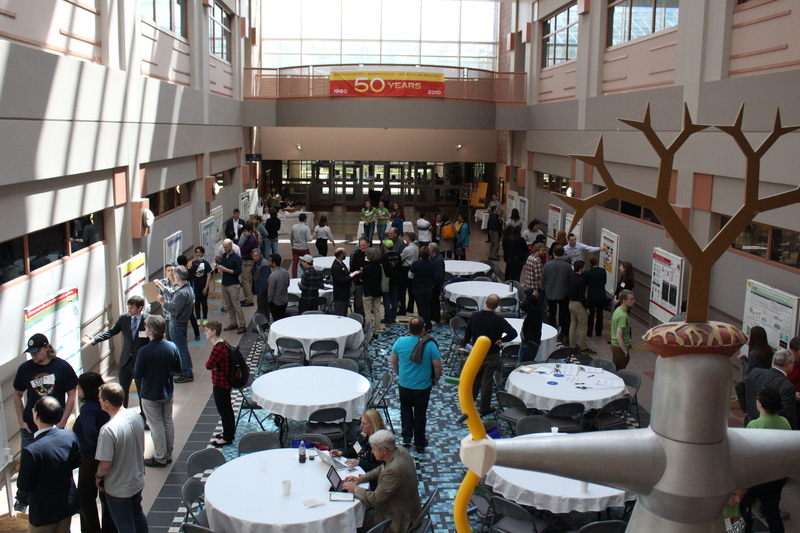 The event includes a poster session with 35 posters, including 18 undergraduate poster presenters. Student speakers Jena Gilbertson (’18 biochemistry), Matthew Cook (’18 biochemistry), and Andrew Tonsager, a fifth year Iowa State student pursuing concurrent bachelor’s and master’s degrees in biochemistry, will present research. Cook also serves as a member of the student committee that organizes the symposium. They spend two semesters planning the event. He said they are excited to see the symposium continue to grow in size and attendance. He will present on his research studying enzymes involved in plant cell wall synthesis. Tonsager will present on the Qua-Quinine-Starch gene in Arabidopsis and its impact on carbon-nitrogen partitioning in yeast. Gilbertson will present on her research using mass spectrometry imaging to study the spatial distribution of metabolites in mutant forms of Arabidopsis thaliana flowers. The Stupka Symposium honors the memory of Robert Stupka, an undergraduate student majoring in biochemistry at Iowa State. He led an effort to establish an undergraduate research symposium to give undergraduates an opportunity to experience the importance of communication in science. Tragically, he passed away in an accident before the first symposium, but in tribute to his passion for research and drive to create the event, his fellow students finished the project and honored him by naming it the Stupka Symposium. The symposium now is an annual event organized completely by undergraduates in the Department of Biochemistry, Biophysics, and Molecular Biology. This year’s alumni speaker is Anthony Cyr (’06 biochemistry) who went on to earn his MD/PhD from the University of Iowa and is currently a resident surgeon at the University of Pittsburgh Medical Center. He was a lab partner with Stupka for the BBMB capstone laboratory class in the fall of 2005 and one of the students who established the first Stupka Undergraduate Research Symposium in the spring of 2006. Keynote speakers are Douglas Weibal, professor of biochemistry, chemistry, and biomedical engineering at the University of Wisconsin Madison; and Virginia Zakian, Harry C. Wiess Professor in the Life Sciences in the Department of Molecular Biology at Princeton University. This year’s event will also include the 2nd annual Adrienne Smith Alumni Student Interaction dinner on the Wednesday prior to the symposium. The event honors Adrienne Smith (’16 BS biochemistry) who passed away in 2017 after a six-year battle with Hodgkin’s lymphoma. Smith was very active with Stupka during her time at Iowa State and the event gives returning alumni and students a place to meet and interact.